The C.M. 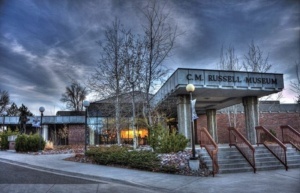 Russell Museum features the work of cowboy artist Charles M. Russell as well as his home and log studio. Changing exhibitions by Russell’s contemporaries are also on display. Museum Store on site. Hours: Summer: Tues-Sun, 10 a.m.-5 p.m. Winter: Wed-Sun, 10 a.m.-5 p.m. Admission: Adults: $9, Seniors: $7, Veterans: $7, Tour Groups: $7 (scheduled), Students: $4, 5years-under: FREE, Active Military: FREE.